A new study suggests that the extreme pressures inside so-called super-Earth planets may create liquid magnesium oxide, a liquid metal, suggesting that similar processes may help create protective magnetic fields around the worlds. 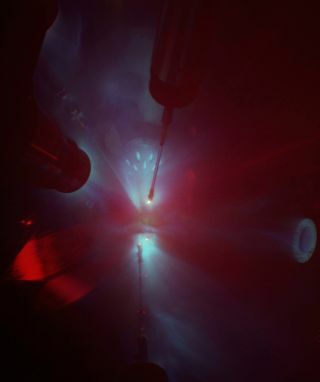 This image depicts a laser-shock experiment on Earth that recreated conditions deep within the planet as part of the study. Image released Nov. 22, 2012. Within supersized alien versions of Earth, a common transparent ceramic may become a flowing liquid metal, perhaps granting those distant worlds magnetic fields to shield life from harmful radiation, researchers say. Among the hundreds of extrasolar planets, or exoplanets, that astronomers have discovered in recent years are so-called "super-Earths," which are rocky planets like Earth but larger, at up to 10 times its mass. Scientists have discovered super-Earths that may support oceans of water on their surfaces on their surfaces, and others that may even be planets made of diamond. The increased mass of super-Earths would bring about internal pressures much greater than Earth's. Such high pressures would lead to large viscosities and high melting temperatures, meaning the interiors of super-Earths might not separate into rocky mantles and metallic cores like Earth's does. Now, researchers find that magnesium oxide, a common rocky mineral on Earth, can transform into liquid metal at the extreme pressures and temperatures found in super-Earths. This fluid metal could help generate magnetic dynamos in super-Earths, they say. "What was most surprising was how well-behaved magnesium oxide is in the laboratory," said lead study author R. Stewart McWilliams, a geophysicist at the Carnegie Institution of Washington. "The physical properties of magnesium oxide look very similar to what has been predicted for decades by theorists. As scientists, we can't ask for much better." These findings might blur the distinction between planetary cores and mantles. "For many decades we have usually imagined terrestrial planets — the Earth, its neighbors such as Mars, and distant super-Earths — as all having Earth-like properties: that is, they have a outer shell or mantle composed of nonmetallic oxides, and an iron rich core which is metallic and from which planetary magnetic fields originate," McWilliams told SPACE.com. "This rule is central to our thinking about super-Earths, yet it is clearly anthropocentric — that is, we are applying what we know from our own observations on Earth to remote planets for which we can observe very little — and, as for many anthropocentric ideas, we are finding that more imagination is needed to understand such alien worlds. "Our results show that the usual assumption that planetary magnetic fields originate exclusively in iron cores is too limiting," McWilliams said. "Magnetic fields might also form within planetary mantles. In fact, this idea has been speculated on for decades, but now we have hard data to show that, indeed, such a 'mantle-dynamo' is plausible." Earth's magnetic field helps protect it from hazardous electrically charged particles from space. "It is often said that life on planets may require the presence of a strong magnetic field to protect organisms from dangerous radiation from space such as cosmic rays — at least this may be true for certain types of life, similar to humans, that live on a planet's surface," McWilliams said. "We find that magnetic fields may occur on a wider range of planets than previously thought, possibly creating unexpected environments for life in the universe." McWilliams noted that much remains unknown about the physics of super-Earths, and that researchers need to generate computer models to see where and how this liquid metal might exist in nature. "Everyone, both scientists and the public, should keep in mind that super-Earths are, and probably will remain for some time, a big mystery," McWilliams said. "It is easy to speculate as to their properties — to draw a picture of one, for example — but quite difficult to make certain conclusions such as we have for our own Earth. This is both exciting and daunting — there are many possibilities to explore, but scientists have much work to do. We hope the public has a lot of patience." The scientists detailed their findings online today (Nov. 22) in the journal Science.